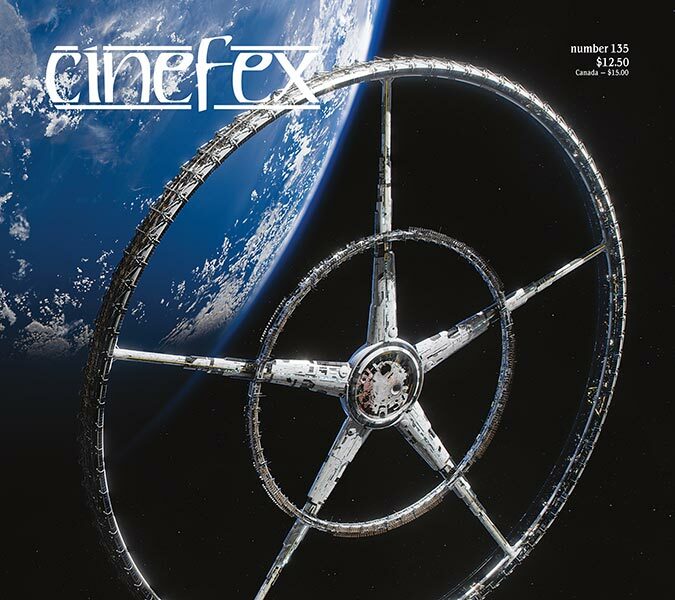 How could every SciFi depiction be WRONG! "To manage Torsion Between an Inner and Outer Hub a bicycle spoke pattern is necessary." 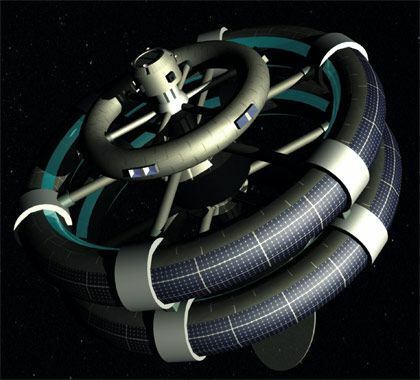 into a Lunar Cycler Orbit"
Based on a Simple Mechanical Structure the STARtel jr provides the Framework to build a Large Rotating Habitat complete with 0.7 Artificial Gravity. This structural design exceeds in three main areas. Provides Strength, Stability, Flexibility and Maneuverability to a large infrastructure making it a truly Space-Worthy vessel. All In One, the launch vehicle has all the equipment necessary to build one unit. Environment Equipment at this scale need to be large. So, we need a new look at rocket design. pumps, ducts, brackets, propellant tanks and equipment can be repurposed. Every dual-purpose pound pays ten-fold at launch. Structural Payload is under 100,000 lbs. That's a lot of Space Station for the pound. The exoskeleton does all of the structural work so there is more freedom in Habitat design. 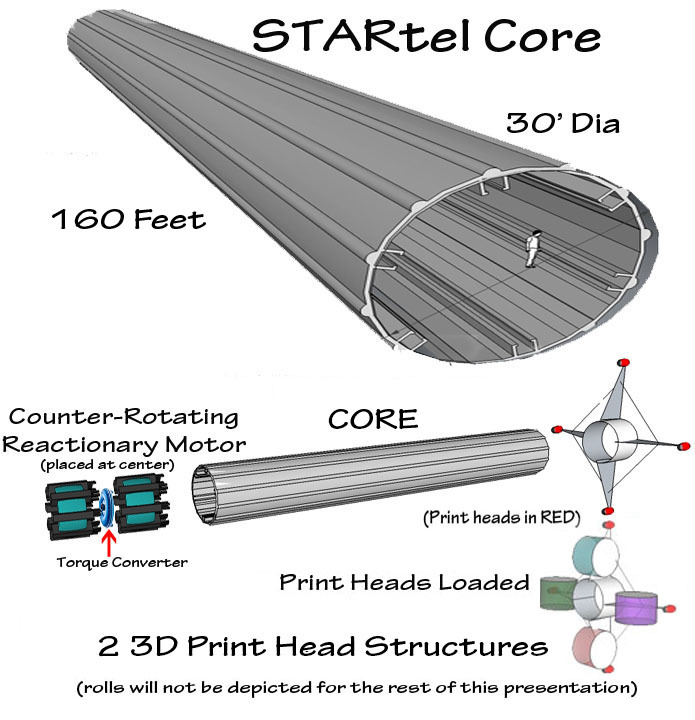 Below is a concept using 3D Print technology to build a full scale STARtel. It is time for Humanity to establish itself in space and transit other heavenly bodies. 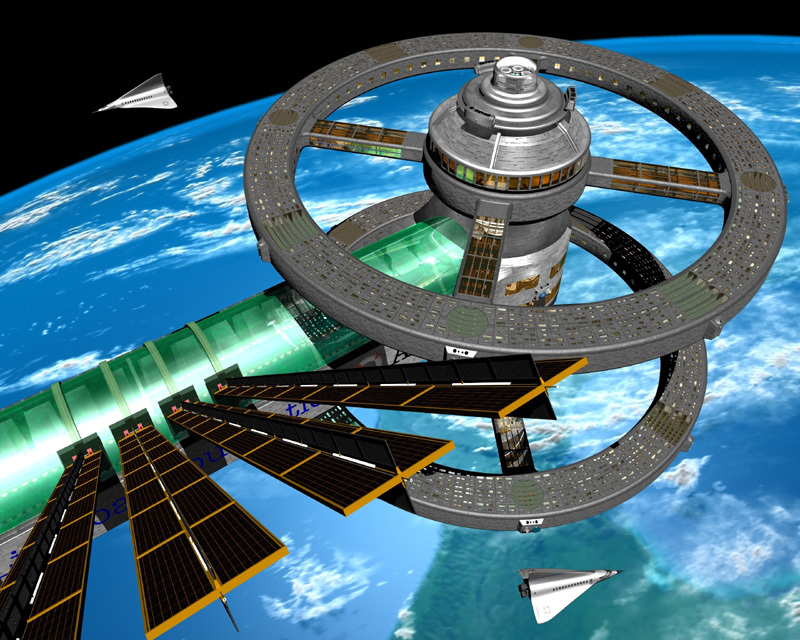 STARtel is a 3D printed rotating space station that is Space-worthy. Interesting concepts emerge as we discover the secrets of this structure. Complete with "how to finance" gives this venture plausibility. It's time for humanity to leave Mother Earth. Silica is abundant on the moon and since silica is clear there may be some nice design attributes. A giant clear atrium can be built on both ends that would allow you to float in space without wearing a space suit. If desired, it may be possible to make the outer perimeter translucent. Water is a superior shielding from solar and cosmic rays. Water can occupy the space in between the double hull. Bio-layering kelp, feeding in salt-water with extra Iodine in combination with new exotic materials has been proven very effective in reducing radiation exposure to near-zero! Also, plastic itself can be culled into a radiation barrier. Just like Apollo 13 hitched a free-ride return trajectory from the moon. The earth-moon cycler would allow a spacecraft to remain in a two-body orbit perpetually with nothing more then minor guidance maneuvers. Generally rockets leaving earth's gravity have various stages to lessen the weight with the new stage having an exhaust nozzle specifically design for attitude, speed and thrust. However, the most dangerous nature of a rocket motor is that both propellant and oxidizer is onboard in large quantity. 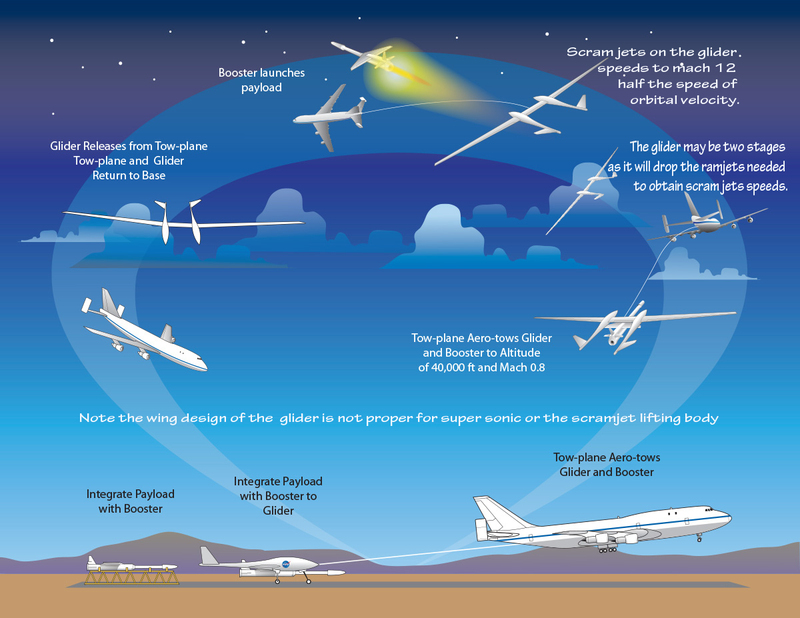 To minimize this danger and weight use of air breathing motors such as a ramjet or scramjet is desired. The higher and faster these motors can lift lessens the exigency of the orbital booster which will improve reliability and reusability. Since there is a habitable destination afoot the onboard environmental equipment footprint of the booster can be minimized. The concept of this illustration fulfills the basic requirements. Either it goes up all the way or it comes down. The passenger cab will detach incase of catastrophic failure. All vehicles must be reusable with a passive return to earth. Safety needs to be passive! Since it may have to do several parabolic maneuverers the environmental system will have to be robust. It will continue with the cycler and taxi to the LUNA station. Reverse procedures for the return trip. The Star Chaser will also serve as a ferry boat, tug boat and sheep dog assisting the non-powered vessels and cargo ships accompanying the CYCLER. The lunar lander needs to be a throttleable chemical engine. The ascent may be perform by a Rail Gun. The vehicle can be refueled at the Luna STARtel and reused. The speed necessary to obtain lunar orbit is approximately 5,000 mph, well within the operational range of a rail gun . Technology comes from Earth, resources foraged from the moon. It's time for the scientist to move over and let the architects, designers and engineers have a shot. A Space Surveyor would recognize the simple fact that, "all materials must come from the Moon". There can be no argument about this, either we're in or we're out. The construction scheduling might take on a different pace than most space projects. Normally a spacecraft has to be meticulously designed, constructed and tested before launch. Those components are designed with forced integration into the structure hopefully without interfering with each other. Design constraints are astronomical. However, on the STARtel you're sending up a union contractor to install an HVAC or pumping station, kitchens and office spaces. Not to make light of the task but the complexity is simply not there. Upgrades and repairs will be commonplace. Once the Print Head designs are completed and tested you are within years of the final build. Is abundant on the moon! That's just what we need! Other minerals may be discovered all over the moon's surface. From my understanding most of earth's accessible heavier minerals are from meteorites later on in the geological process, as Earth's original heavy metals sank into the core during the molten phase. This indicates that each crater will have a unique geological signature. So there may be cache of gold beneath the moon dust! What would the moon look like if the dust could be removed?? A typical water bottle can hold 100 psi. will aid to strengthen the structure. major drawback on space travel. No one can do it on their own! We the people, need to ask ourselves what is the purpose of Space to Humanity? The real question is, as with the 'Corp of Discovery' ,is it that important to discover new lands? The answer is yes, but no government has the will, purpose or funds to finance this project in the magnitude that is required. Only with entrepreneur, capitalistic methods can a project of this scale be accomplished. With capitalism, money, value, expense, asset and liabilities need to be valuated and balanced for true success. A projected return on investment is paramount. The International Space station is a ongoing liability. The Silicon Valley Titans are looking to the stars wanting to setup a moon base. Going to Mars requires a sizable base station. Without a transit system these are huge expense with high risks and very little tangible R.O.I. Without ongoing expense and upkeep they have no value at all. A holistic approach that creates value and worthy of investment is desired! What needs to be built is a Habitable Transit System. Megalithic in size to become its own stable habitat. A city unto itself with Real Estate. Just let the people take it from there. The orbital pathway local to the STARtel will be teeming with other structures filled with entrepreneur farmers, contractors and businesses. Cargo of a earth bound mineral mined from the moon can be in accompaniment. 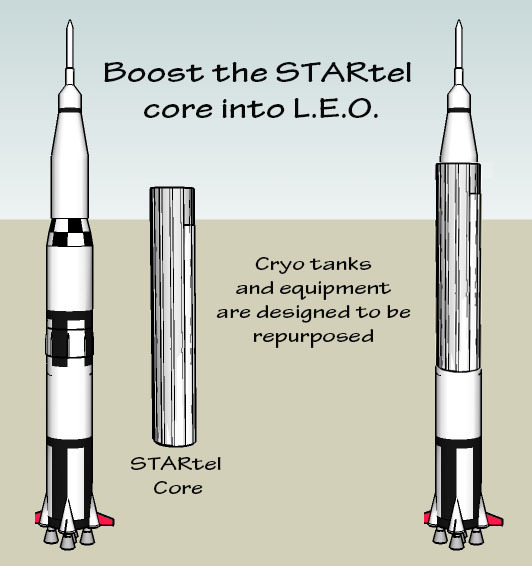 Ten years after construction the value that the STARtel may create will surpass all of the combined value on Earth . The Finance Plan is Simple. The class A investor will develop, deploy, manage and profit from their chosen business enterprise and also receive considerable swaths of Moonland in return. Similar to the method used to build the U.S. Transcontinental Railroad. Whereas land grants were offered to collateralize the enormous debt. Before bidding, robotic prospecting probes will be deployed around the moon for soil samples to aid investors decisions. The minute this deal is signed, property value on the moon sky rockets. The STARtel transit system is for all takers. You invest, you will own real estate on the moon.